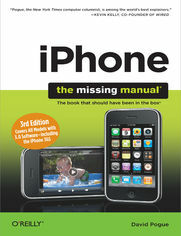 If you have a new iPhone 3GS, or just updated your 3G with iPhone 3.0, iPhone: The Missing Manual, will bring you up to speed quickly. New York Times tech columnist David Pogue gives you a guided tour of every feature, with lots of tips, tricks, and surprises. You'll learn how to make calls and play songs by voice control, take great photos, keep track of your schedule, and more. This entertaining book offers complete step-by-step instructions for doing everything from setting up and accessorizing your iPhone to troubleshooting. If you want to learn how iPhone 3.0 lets you search your phone, cut, copy, and paste, and lots more, this full-color book is the best, most objective resource available. Unlock the full potential of your iPhone with the book that should have been in the box.